First Nations leaders from across North America demand better environmental protection, more say in oilsands development. Hundreds of First Nations people marched to the oilsands operations surrounding Fort McMurray Saturday to protest against the damage they believe the industry is doing to their communities. "We have come from all over North America to walk together through the heart of the destruction caused by the ever-expanding tar sands and offer prayers for the healing of the land and its people," Dene National Chief Bill Erasmus said in a release. 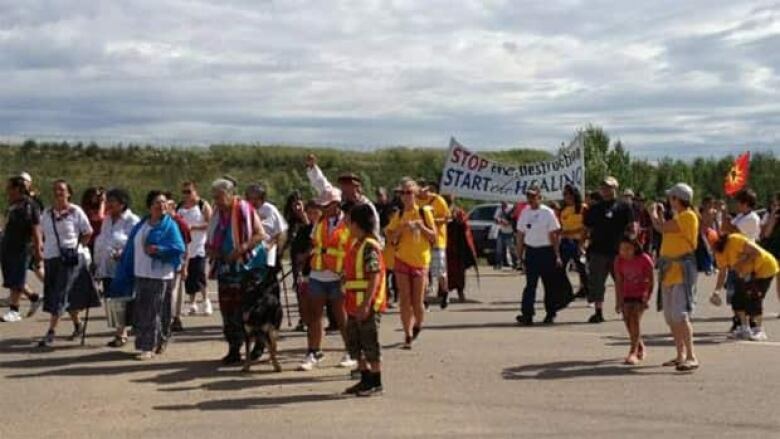 For the third year, participants of the Healing Walk trekked 13 kilometres through the area affected by oilsands development, stopping to pray along the route. First Nations communities in the area say the development has disrupted traditional Aboriginal hunting and fishing areas and caused serious health problems for people living nearby. "The places where we used to pick berries and find our medicines have been destroyed by rapid tar sands projects," said Anthony Ladouceur, Councillor of the Athabasca Chipewyan First Nation. "Our people have lived here for thousands of years, but it is becoming increasingly difficult to continue to live off the land with industry expanding all around us." This year, Alberta protesters were joined by First Nations leaders from British Columbia, the Northwest Territories and Ontario, many of whom brought water from their communities to take part in a ceremony highlighting the importance of clean water. They say both the Alberta and federal governments need to do a better job in consulting with them on oilsands development and environmental protections.